The photo above is free. You can reuse it, as explained in its Licensing terms. Actually, you will not be the only one. Many publications have already done so, and I've seen this pictures used in dozens of places. I took the picture because I like taking pictures. I've invested a lot of money into camera gear over the past 27 years or so and never made a dime from it. On the other hand, it has given me a lot of joy and pride. The joy to take beautiful pictures. The pride of building the reputation of being a decent photographer. The pleasure to give away my work and see people smile. The satisfaction coming from the fact that my work is useful, seeing it's reused by others. 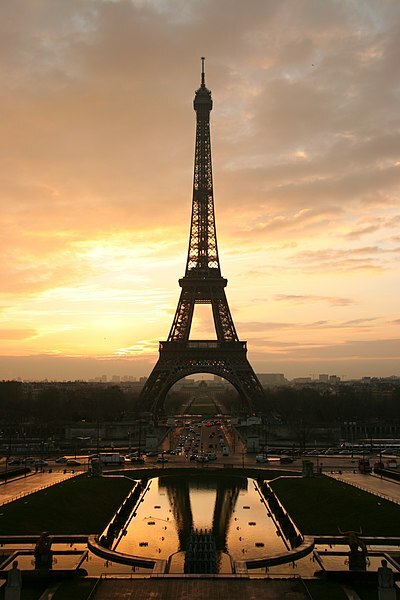 Of course, after taking this picture of the Eiffel tower in Paris, I could have said that it cost me a lot of money. So I should not share it. And the picture would have stayed on my hard drive, far from the eyes of people who could "steal" it. But I gave it instead to Wikimedia Commons so that it could be reused by other people on Wikipedia articles and elsewhere. I also gave dozens of photos to Wikipedia. Some of them have been published in highly successful books. I don't regret giving this photo to people I don't know. It has cost me a little, but brought me a lot more in return.. because I made it available to the world. It would not have happened if I decided to leave it hidden in my hard drive. So if you want to reuse it, please be my guest: I'd rather see my artwork used than forgotten. Most of all, I have realized a long time ago that in a world where everyone has a camera, a lot of free time and fantastic tools to publish stuff, there is not a lot of money to be made anymore by taking pictures. Hundreds of comments later, I'm revisiting this post and the issue it discusses. For the record, I understand the position of professional photographers, as explained in This photograph is not free post. I should mention that my younger brother is a pro photographer, shooting fashion here in Paris, for large publications and famous brands such as Hermès and Levi's. I don't want all pro photographers to die from starvation. I completely agree that someone can refuse to see his work reused for free. I do it myself (this post for example is not under a free license). But the world is changing, with 141 million cameras sold in 2010 (not counting gazillions of smartphones) and the ability for people to publish on the Internet and potentially reach millions of people with a touch of a button. It's a tough world for pro photographers, but it's a great progress to see millions of people being able to do art. Thanks to the comoditization of photography (and tools that enable creativity, from music instruments to computers), we're likely to see more and better talent emerge. The downside is that average photographer will be less likely to live from their craft. I can live with that. The other option is to prevent distribution of cameras and shut down the Internet in order to come back to the "good old days" of publication scarcity. Not what I want, really. For example, I took the picture of the guy with the I Love the Web sign on a high-traffic page of the Mozilla Website. Which is approaching 12 million freely reusable media files. on Reddit, Hacker news and Hacker news again.